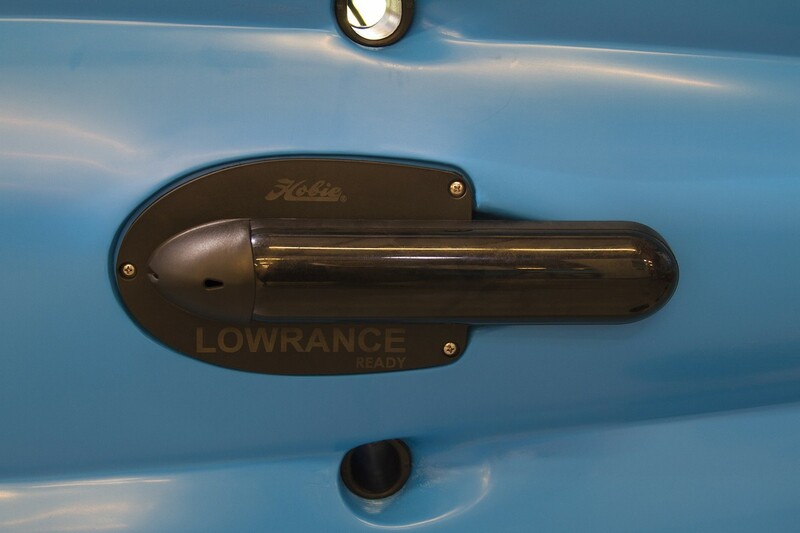 The Lowrance Ready TotalScan Transducer plate was developed by Hobie and Lowrance to accommodate the TotalScan Transducer and allow it to function with optimal performance. It works in conjunction with the plug and play Lowrance Ready System found on popular Hobie fishing kayak models. Our mount leaves the transducer completely open and free of obstruction so you get the most accurate readings while having enough protection on the front to shield the transducer. Sometimes one just has to blend in to stand out…to sneak up on bass, to get a jump on birds or simply to make a statement. Introducing Hobie’s new Camo Series. Hobie’s first-ever color blend will be available for the time-tested Mirage Pro Angler 14, Mirage Pro Angler 12 and the Mirage Outback, the three models in Hobie’s line-up most popular with anglers and bird enthusiasts worldwide. The new camo will replace the olive green color on these three models, all equipped with the MirageDrive® 180. 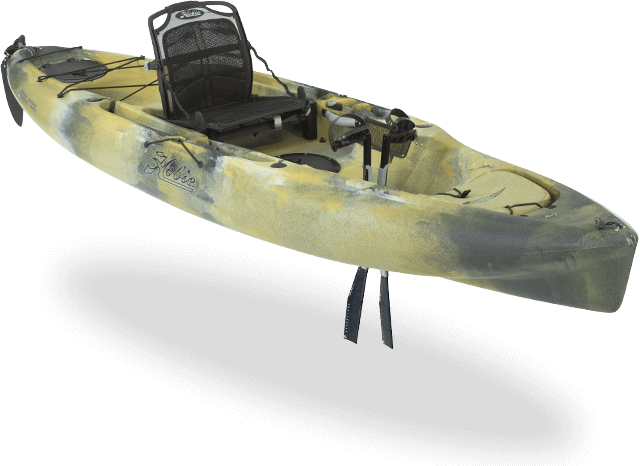 Each hull boasts a uniquely different camouflage pattern along with special camo graphics and pads to appeal to those Hobie fans that prefer a more subtle approach than the popular colors found throughout the company’s recreational line of kayaks. The Camo version of the Mirage Outback also includes ST Turbo Fins as standard equipment. MSRP’s are coming soon. The Camo Series will be shipped to retailers starting in October, 2016. The Camo Series Hobie Mirage Outback. Hobie’s bioengineered MirageDrive propulsion system for kayaks was revolutionary in its inception in 1997 and has been evolving ever since. Now comes the biggest evolution – so far. Introducing the patent-pending Hobie MirageDrive 180 forward-reverse propulsion system that will be integrated into all 2017 model year Mirage kayaks. Weighing in at under eight pounds, the MirageDrive 180 produces full power in both directions and offers unprecedented maneuverability. The user can pull one of two shift cables to direct propulsion 180 degrees almost instantly from forward to reverse and back again. Imagine the possibilities: backing fish out of cover; safely fishing closer to obstructions; or fishing downstream while holding in current. Hands-free propulsion in any direction means better control: to cast, to present baits, and to concentrate on landing bigger fish. And then pictures can be snapped or cold beverage enjoyed on the way back in without ever stopping. There are two shifters, one marked in green for forward and a longer one in red for reverse, making them easy to identify. Pulling the appropriate cable pivots both MirageDrive fins 180 degrees, reversing the direction of the power output. Although the forward-reverse capability is the most noticeable improvement to this new generation of the time-tested MirageDrive, it’s not the only significant advancement. The new fins are even more durable, with high strength nylon on the leading and trailing edges. Adjusting fin resistance has also been improved via an easy-access knob. The fin shape, altered to allow the fins to rotate from forward to reverse, provides the same efficient power as past models of ST Fins and ST Turbo fins respectively. Can the MirageDrive 180 go shallow? Absolutely. Use partial pedal strokes to “flutter” the fins or push one crank arm forward so that both fins automatically fold up flat against the bottom of the hull. This same wing-like action excels for dodging obstacles, shedding weeds and gliding through the water with minimal resistance. It also facilitates landing on the beach or at the boat ramp. The MirageDrive 180 installs in seconds thanks to the Click and Go Mounting System, which also makes removing a snap. The MirageDrive 180’s cranks adjust to comfortably fit the user’s height, from tall to child-size. Cleaning and maintenance is simple. A quick rinse at the end of the day and an occasional spray with Hobie Multi-Lube is all it takes. Fishing Product Manager Morgan Promnitz took the MirageDrive 180 to remote and demanding Cedros Island in Baja, Mexico for intensive testing. “The shifters really shine. I found myself using them constantly,” Promnitz says. Promnitz fished nose-in to a breakwall for powerful grouper. Every time he hooked up, he’d throw the MirageDrive 180 into reverse and back the fish out of the rocks. He also used the shifters while taking photos of friends connected with big fish, to get just close enough, backing away if the fish ran. But the most surprising use was trolling in reverse with live bait in front of him, where he could watch its every move. “A bonito school came up chasing the live mackerel I had on for bait. I subtly guided it towards them to entice a bite. It was cool watching the action go down,” he says. The uses of the shifters are endless. They are helpful, for instance, when you suddenly realize your Mirage Tandem Island mast isn’t going to clear a bridge. “I quickly pulled the reverse cable and backed my Island to safety,” Hobie engineer Jim Czarnowski recalls of his close call in the grueling Everglades Challenge endurance race. When pinpoint navigation is necessary, Czarnowski shifts from forward to reverse and back again. When coming into or leaving a dock, he backs the Tandem Island in and out of its parking bay, just like a car in a parking lot. The two shift cables are composed of braided Spectra line connected to high strength, snag-free nylon handles. They tuck into a Bungee® retainer when not needed. The MirageDrive 180 will be standard with all 2017 model year Mirage kayaks, including the legendary Outback and award-winning Pro Anglers. 2017 model year kayaks are slated to begin shipping in October 2016. The MirageDrive 180 is retrofitable to existing MirageDrive kayaks and is expected to be available as a stand-alone accessory by mid-year 2017. Hello, my fishing friends! I hope all is well and the fishing has been good to you. We’re going to address live bait and how to utilize the right bait for the particular species you’re seeking. We’ll also cover how to utilize your Hobie Livewell. I have been asked many times by people who don’t fish regularly or who have never fished off a kayak, on how to keep bait alive. My answer is simple. We use our Livewell that is specially built for Hobie fishing kayaks. Now if you’re lucky enough to launch out of a harbor that offers bait, getting bait is simple. You’ll pull up, ask for a kayak scoop, pay the man, and you’re ready to go. Otherwise, you’ll have to make your own bait in open water using a sabiki rig, which is very helpful by the way. Just Google it and your bait making process will be a lot easier. I also recommend getting a bait net. These are very helpful. We’ll get back to that later in this article. Alright, you’ve got your bait and hopefully it’s what the fish are craving. Certain size baits require certain size hooks in order for them to swim properly and also stay properly hooked. If you get a batch of small bait, utilize it more inshore. That’s not to say it won’t draw fish offshore, it’s just been my experience that it pays off inshore. Now this is not rocket science or fact, but usually the bigger the bait the bigger the fish. The problem with that is, it takes more time and usually it’s a gamble on how productive the day will be. But fishing is about patience. Its rewards are greater. Now let’s say you catch a keeper fish but you want to keep alive till you come in. Well, lucky for you, you have your Hobie Livewell on board. Place your catch in there. But now you have a fish in your bait tank. How are you going to get your bait? Well, it’s simple. Remember that bait net we talked about earlier? Grab it and scoop out a piece of bait with your net and place it on your hook. All bait is gross, stinky, sometimes slimy and always wiggly. Grab hold of your bait firmly enough to gain access to its head, but don’t squeeze too hard that the bait starts scaling all over your hand. They will die shortly after you start soaking your bait. Also, if your bait is too big and easily filling up your bait net, what I discovered is that it’s a little easier getting your hook ready while your bait rests in the net. Place your net in between your mirage drives and let the bait just sit there while your prepping your gear. When you’re ready, it’s one quick swoop to getting your bait on your hook. I have run into a battery life situation on my Livewell a few times. Sometimes I had a low battery or I was out on the water longer than the battery life. My solution is simple. In that case if your battery is low every 10 to 15 mins shut off your bait tank. Turn it back on 5-10 mins later. This will give you a little more battery life to survive the rest of the day. Do this throughout the day and it will be a true help– especially in tournaments. I hope this article is helpful for you. Until next time, keep your lines tight and stay fishy my friends!